We’re back and how …. 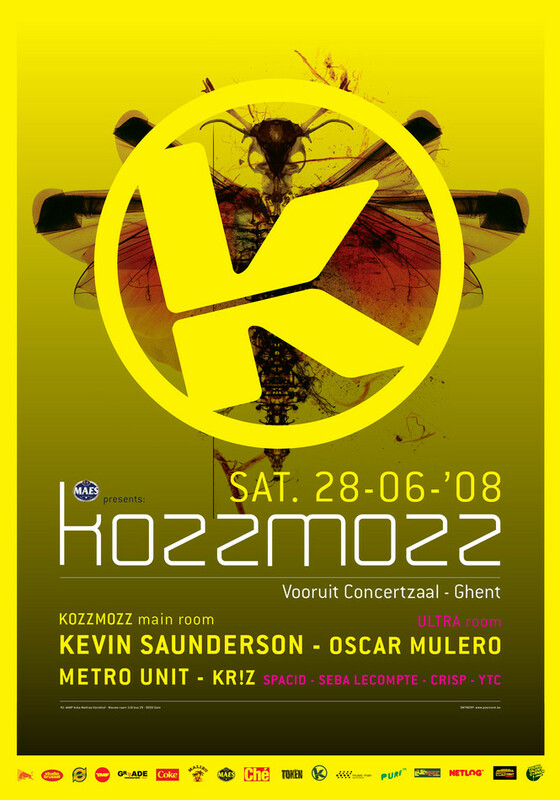 For what’s usually the best Kozzmoz party of the year ( although this time it may be hard to top the last edition in March which was generally described as one of the best Kozzmozz parties in Vooruit but we sure will try to do it again and can only succeed with your help ! ) , we have invited one of the three founding fathers of techno and constant innovator, Mr. Kevin Saunderson ! With his different projects Kevin was proclaimed ‘Best Dance act in the world’ twice, can put 4 gold singles and one gold album to his name and had no less than seven n° 1 club-hits in the UK. He doesn’t solely rely on his past successes though but is still active with his History Elevate Series of which Parts 1, 2 & 3 have recently hit the shelves. And is currently collaborating with the new generation dj’s and producers as Joris Voorn, Loco Dice and Simian Mobile Disco. Work with names as Luciano and Matthew Jonson is to follow. For Kozzmozz he will bring a full on techno set, just the way we like it ! He will be joined by Oscar Mulero who’s a real icon / super star dj. in his home-country Spain and recognized all over the world for his labels Warm Up en Pole Recordings on which he also produces with Cristian Wünsch. He can also be found on Mark Broom’s Pure Plastic as Trolley Route. The foreigners are joined by Metro Unit Live, the newest project of Trish van Eynde and Sam Ostyn. Two true admirers of the Detroit techno-scène who have had releases on labels as MB Elektronics and Technasia’s Technorient. More recently they run their own Electric Art label as well as the Electric Art parties in Fuse. Our resident Kr!z is one of those few dj’s who possesses the gift to play great records and have an astonishing mixing technique. Kr!z also runs his own label Token records, with releases from Inigo Kennedy, Sub Space (aka Julien and Gonzague), Radial and now Dimitri Andreas ! With the exams being over and / or people just being geared up for a great summer, we’ve added our newest Ultra concept to the festivities again also. The better minimal sounds of the moment, brought to you by Belgian dj’s who know what they’re doing ! Resident Spacid will bring his collection of minimal records. When he’s behind the decks, the atmosphere is always great ! He gets the company of Seba Lecompte who regularly plays the Fuse club and runs the Minor Moves parties in Decadance with great success as well as Crisp who , next to working at the Fuse club, has played many parties and launched the Bokal Label with Ivow. Kozzmozz also gives a young talent again the opportunity to show his or her skills to a wider audience ! You want to be the one, send in your demo’s to Poppunt and we will select the best one. More info on their web-site !